Well, fans of The Walking Dead finally got what we asked for, the television appearance of Michonne--the black woman katana (sword) wielding zombie killing machine. Michonne had quickly become a fan favorite in the comic book series, so we waited patiently or anxiously for her to become fully realized in the television version of the series. She showed up in a closing scene of the finale of season 2, and everyone rejoiced anticipating her more frequent appearances in season 3. She's here now, and we've seen quiet a bit of Michonne so far. It's rare to see a black woman taking such a leading role as a lethal and skilled force in a mainstream television show. In the history of horror films at least, women are often presented as "scream queens" and sexualized objects who are frequently pursued by monsters and psychopaths, and then rescued by apparent brave men. So Michonne represents a notable difference--a black woman in horror who is quite capable of taking care of herself and others. Ah, but there's a problem that may or may not stand out to most viewers of the television show, but it should be apparent to long-time followers of the comic book. In the television show, Michonne is skilled with her katana, but her more distinguishing trait so far is her constant pouting. 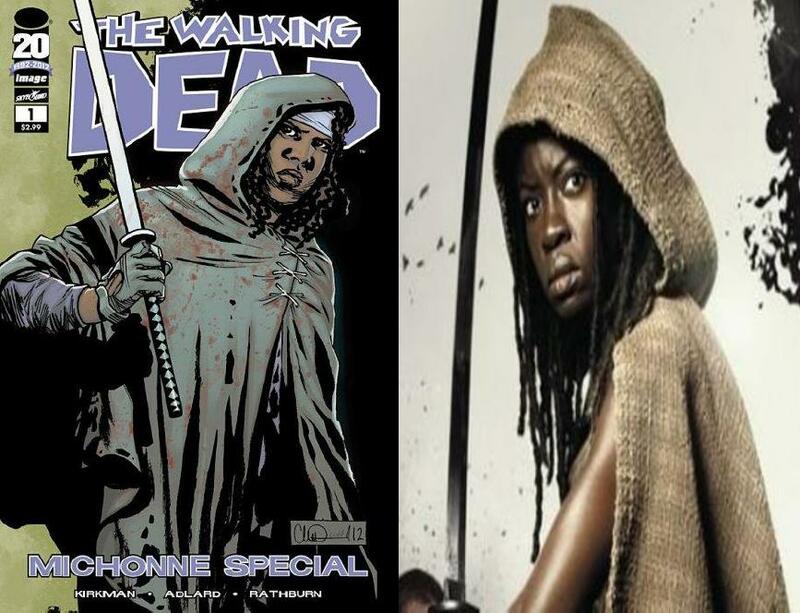 In the comic book series, Michonne's fierce indifference is more prominent. That is, she doesn't care enough to pout or become overly upset. Featuring a black woman as angry and pouting vs. a black woman who is discontent yet indifferent is a notable contrast. Unfortunately, the brutish Michonne of the television show more closely resembles troubling stereotypical images of black women throughout the history of mainstream representations. The more contemplative and complex Michonne of the comic book version does more to alter long-held views of black women, especially in comparison to this television version. I regret sounding like typical commentators with the "book is better than the movie" line. Overall, I have enjoyed both versions with their divergent story-lines and all. Still -- and I know I shouldn't be surprised -- a more compelling television representation of Michonne would have been an important step for black people, women, and general viewers.